"These gorgeous cream puff "crack buns" were inspired by the Great British Baking Show, which is currently my favorite thing on television. Speaking of favorite things, Boston cream pie is one of my all-time favorite desserts, and this was basically an individually portioned, probably superior version of that. These would be great filled with all kinds of things, but it's hard to beat vanilla bean pastry cream (see footnote)." Mix butter, brown sugar, flour, and salt together in a large bowl using a spatula. Place dough between two sheets of waxed paper or inside a zip-top bag. Press or roll dough to 1/4-inch thickness. Trim off the edges slightly to get a rectangular shape, if desired. Freeze crust until ready to use. Preheat the oven to 450 degrees F (230 degrees C). Line a baking sheet with a silicone mat. Combine water, butter, and salt in a saucepan; bring to a simmer over medium heat. Add flour; stir with a wooden spoon until mixture comes together into a smooth dough and pulls away cleanly from the bottom of the pan. Transfer to a bowl and spread out with a whisk to speed up cooling. Cool until warm, about 10 minutes. Whisk eggs, one at a time, into the pastry, mixing well after each addition. Finish mixing with a spatula. Scoop pastry into a pastry bag and pipe into 6 to 8 buns on the baking sheet. Smooth out tops with a wet finger. Use a cookie cutter to cut crust into circles about the diameter of the buns. Lightly push crusts onto the buns, just enough to secure them. Place buns in the preheated oven. Immediately reduce heat to 350 degrees F (175 degrees C) and bake until browned and fully puffed, 30 to 40 minutes. Transfer buns onto a cooling rack and place rack back on the baking sheet. Place in the turned-off oven, leave door partially open, and let cool completely, at least 20 minutes. Melt chocolate in a microwave-safe glass or ceramic bowl in 15-second intervals, stirring after each interval, 1 to 3 minutes. Spread a few teaspoons of melted chocolate onto the bottom of each bun. Gently press each chocolate base back on the baking sheet to spread it evenly. Let chocolate harden, about 1 hour. See my recipe for vanilla bean pastry cream. While I enjoy it straight, traditionally it would have some whipped cream folded in to lighten the mixture. To fill the puffs, first cut a small hole out of the surface of each bun along the cracks. 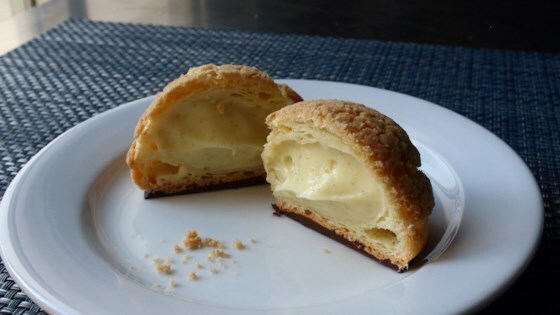 Pipe desired amount of pastry cream inside and replace the missing piece. Not too difficult but more labor intensive than I would like. FYI I poked a hole in the bottom to fill with pastry cream. Then it was easy to cover the hole with the chocolate bottom. Not the easiest thing I’ve ever made - but one of the tastiest. If you follow the recipe and don’t cut corners, you will succeed. And it’s so tasty! Will definitely make it again. These were delicious and fun to make! These are gorgeous. I didn't understand the recipe fully after just reading it, so it's imperative (IMO) to view the video.